If you’re going the bespoke route, it helps to understand the vocabulary and makeup of a ring. This sketch of a trilogy ring breaks down the components of a stone set ring but even if the ring has fewer or no stones, the vocabulary remains the same. The central stone in a trilogy ring is the one in the middle. In a single stone set ring you might still call it the centre stone. When designing a ring, this is normally the starting point of the design as the rest of the piece works to either emphasise it or complement it’s shape, size and colour. The side stones are usually set in similar settings to the centre stone, though they might not always be the same shape. The height of these stones are often lower than the central stone so you achieve a stepped look. They often help to draw the eye towards the central stone, such as the Trillion cut side stones in Elizabeth Hurley’s ring as mentioned in our Diamond Shapes blog. The setting is the metal which holds and protects the stones. The sketch shows a traditional basket style pronged setting where thin strips of metal fold over the edge of the stone to hold it in place. Read more about the different types of settings here. The shoulders are the section of band worn at the top of the ring. From the side, they look a bit like human shoulders and connect the band of the ring to the centre stone. These are usually deeper than the rest of the ring which helps to blend the setting into the band. This makes it more comfortable to wear and helps to protect the setting and stone from knocks. 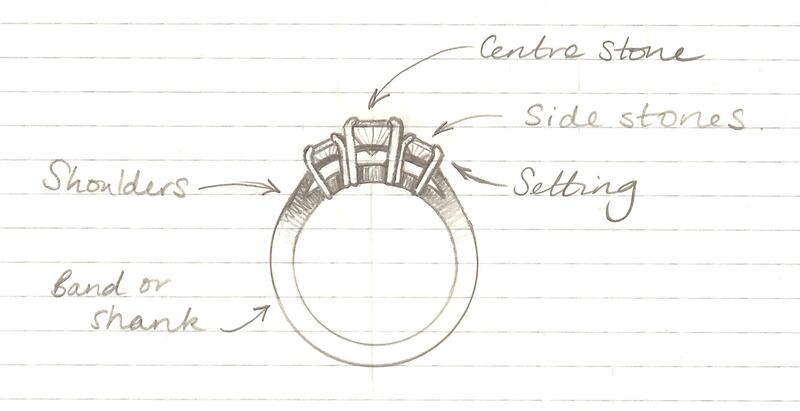 The shoulders I have sketched here are split in the side view which helps give the ring a light feel and works well with the spaces in the settings to create a crescent shaped gap under the stones. Read more about different shoulder designs here. The band, sometimes referred to as the shank is the main body of the ring, which wraps around the finger.